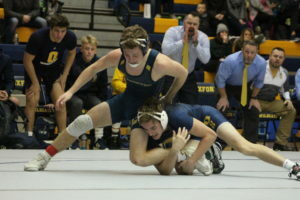 It was a battle between blue and gold for the two wrestling powerhouses Clarkston and Oxford for the OAA Red league title. It came down to the last match of the night in the 160-pound weight class with the Wildcats in the lead, 29-27. Wolf Devin Trevino scored ten points in first period, holding his opponent to only one point. 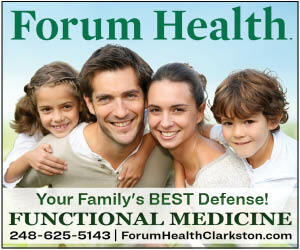 He scored six more points in the second period to win 16-1 for a technical fall, giving Clarkston a 32-29 win. Oxford opened the night scoring four points in the 171-pound weight. Clarkston’s Frank Davis (189) took the lead in the next match, keeping his opponent scoreless during two periods. He finished the match with the win and four points to tie the score. The Wildcats took the lead back with a pin with 19 seconds remaining in the 215-pound weight class. Jacob Jones (285) had a reversal with 58 seconds remaining in the first period and 20 seconds later won with a pin, tying the team score, 10-10. Oxford won the next two matches to lead by nine points. Clarkston won the 119-pound weight class when Ashton Anderson pinned his opponent with one minute remaining in the second period. Cole Wiegers (125) was control of his match finishing with a 14-4 win, putting the Wolves in the lead 20-19. The Wildcats came back to win the 130-pound weight class, 6-3, the 135-pound weight class in overtime, 14-12, and the 152-pound weight class, 15-5. Clarkston won two matches. The wins were from Conor Donahue (140), 14-7; and Ethan Polick (145), 14-3. He added some wins standing out included Wiegers over a ranked opponent,as well as Davis and Jones. The Wolves host Detroit Catholic Central on Wednesday, 5:30 p.m. They head to the OAA Red tournament this Friday at Rochester Adams, 4 p.m.
Then, they prepare for the MHSAA district competitions for the team and individuals. The MHSAA Wrestling Team District meet is next Wednesday at Troy High School with the Colts, Waterford Kettering and Waterford Mott competing for the title. The Wolves host the MHSAA Wrestling Individual District meet on Saturday, Feb. 9.